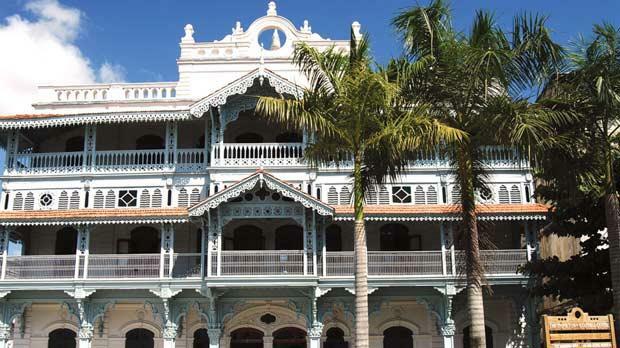 Grandiose house in Stone Town. Bustling daily life in the capital. Right: Monument to slaves outside the Anglican Cathedral. 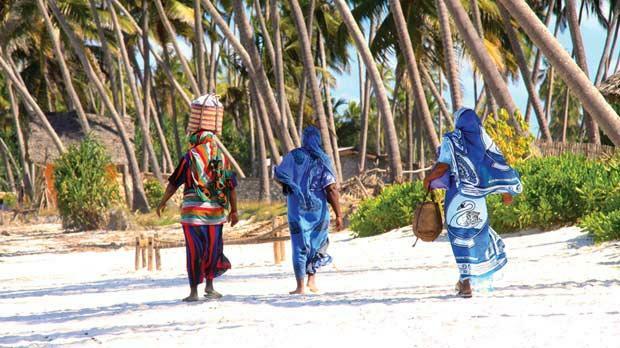 Local women on Jambiani Beach. Like every morning it is the call to prayer that wakes me, resonant voices joining together to sing Allah’s praises as the old town’s rooftops emerge from the darkness. The African sun goads the roosters into action, their cacophonic squawks challenging the stillness of the ocean air. Next are the schoolchildren, singing their times-tables, allowing the choral beauty of their learning to rise proud among the centuries-old streets. Every morning it’s the same sounds that indicate the time with a metronomic consistency. All around Zanzibar there is beauty; visions of paradise giving the impression that the island is a postcard to stir envy among friends, with water so clear the distinction between sand and ocean blurs into oblivion. Palm trees sway; a beach volleyball court provokes sunbathers into action. From Kendwa and Nungwi in the north to Paja on the south-east, Zanzibar is a hypnotic loop of beach perfection that lulls people into hibernation. But this serenity masks an island struggling to halt its fall from grace, neglected by a government and plundered by foreigners. Away from the shore the luxurious resorts become soggy wooden shacks, and the lobster dinners give way to lumps of maize meal. Locals are being left behind. The Tanzanian government – in more politically correct words – has said Zanzibarians’ opinions are unimportant, their voting unlikely to affect election results. And the discovery of oil in its waters has firmly squashed any hope of independence from their unhappy political union. Government officials, imported from the mainland, do little to hide their contempt for locals, setting up corrupt roadblocks every few kilometres, running government offices at apathetic pace. There was a time when Zanzibar was the most powerful place in Africa, a trading post used by the elite of Europe and the East. But wait, can Zanzibarians really complain? Isn’t their history based on exploiting the mainland that now controls them? Standing in a gloomy cave in the capital I’m brutally witnessing this past. One tunnel leads out to land, a passage that prisoners would take only once. The other leads to water, across the sand to a brutal ocean journey and slavery. 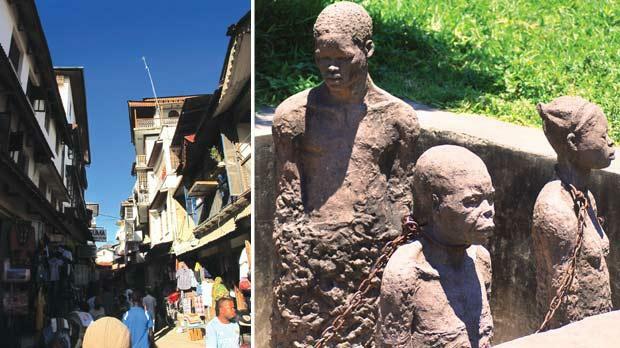 Zanzibar was a trading post even after slavery was outlawed; a halfway house of deceit and corruption. Through these secretive caves, 23,000 slaves were exported annually to wealthy Europeans running plantations along Africa’s east coast and beyond. 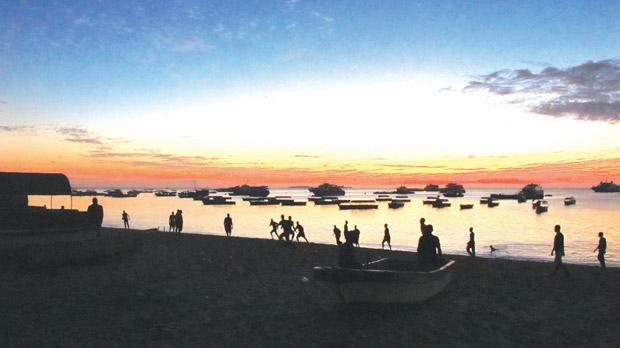 For over a millennium Zanzibar has been a visitor’s playground, a place of exchange and mutual advancement. People, leopard skins, spices, tortoise shells, ivory; since the 10th century Zanzibar was exchanging Africa’s wealth for cotton, porcelain and rice. But in the 21st century the locals are running out of things to trade. Their coastline is in the hands of outsiders and the state museum blames tourism for “the constant threat from the overwhelming coca-cola culture on the fragile local culture”. Mama’s morning question, “you want masala tea?” sums up Zanzibar: halfway between the Middle East and Africa. Masala means mix. While the coast has been busily manufacturing the monotonous postcard holiday experience, the old town’s organic development is enabling Zanzibar to retain its masala, its captivating blend that nobody can put into a box. An incompetently managed renovation project of the old town failed and private house owners opted for cheaper modern building materials over an aesthetic replica of the island’s past. At a glance Stone Town – the old town in the capital Zanzibar City – appears to be decaying, disregarded. Yet to focus on badly rebuilt individual buildings is to miss the whole. Its charm comes not from admiring a manicured city but in stumbling across fascinating gems while lost within its maze. Original 17th-century stone, crumbling and enchanting; a thick wooden door dotted with the black metal spikes of a regal history; 10 men watching a game of backgammon in a cramped public square; barbecued squid sizzling. The old town’s streets are narrow and haphazard, each turn a right angle, so why does it feel like I’m going around in circles? Cobbled together through years of disintegration and growth, the labyrinth is an ode to the cycles of wealth and neglect. Standing proud, 400 years and counting, a grand wooden archway marks the entrance to Mama’s house, a three-story piece of nobility, my room overlooking the rooftops. From the window I look left to the mosque, the simplicity of its white stone having a soothing effect. Gazing upwards, a cathedral’s spire dominates the horizon. Beneath me a man wheels a wooden cart of oranges, whistling to himself, turning right and heading past the Hindu temple. Leave the map behind, walk, get lost. Around a sharp corner the market emerges, its concoction of colourful spices merging with the pungent fishermen’s catch. Further still and two village football teams compete for a goat as Rastas and mullahs watch on. Down the alley, back past the boutique hotels, and out into Forodhani Gardens, four dozen paraffin lamps light a giant collection of outdoor street restaurants. Go slow, stop, observe, listen. On every street there is something to find; in every alley there is something to admire; barefoot children skip around, a public chalkboard displays the latest football results, a boisterous café serves up goat curry, 15 men watch an African soap opera on an outdoor television. Quicker now, searching the old town’s main attractions, admiring how the overwhelming masala stays in focus. The Indian grandeur of the Old Dispensary’s balcony; the Hamamni Persian baths; the carved door on suicide alley leading into the house of Tippu Tip, the wealthy slave trader; the Arab splendour of Beit ul Hukum palace, bombarded by the British for 38 minutes in 1906 during the shortest war in world history. Arabs, Dutch, British, Persians, Indians, Chinese and now tourists... for over a millennium visitors have been coming and trading cotton for tortoise, dollars for five-star luxury. Yet out of this international blend comes a group of people with a culture as unique as their old town. While the world has been plundering, Zanzibarians have been learning, allowing a cross fertilisation of ideas to shape who they are. They are proud of being from a place where such a diverse blend of people can live and prosper in harmony. And as I listen again, I find symbolism in the morning sounds. The call to prayer is a reminder of the importance of faith. The brutal roosters, alarm clocks of African life, hint at the need for resilience. Those schoolchildren, hope and positivity for the future, the next generation of locals who will fight to keep Zanzibar away from the obnoxious advancement of tourist resorts. And Mama’s voice. Stop. Relax. 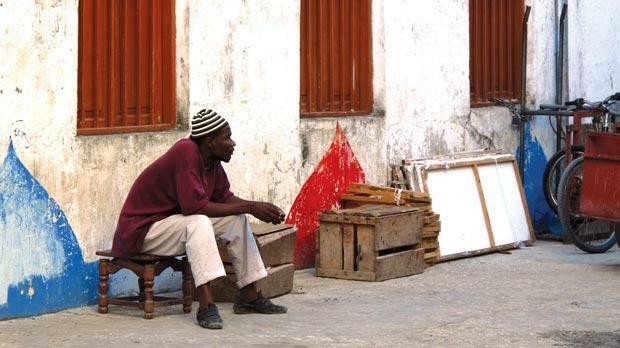 There’s always time for a masala tea and a chat in Zanzibar’s old town.